Cape Town - Evan Flint, the astute young Newlands pitch curator, has started relaying the pitches at South Africa’s most popular Test venue ... but one of the existing ones will be employed for the first encounter with New Zealand from January 2-6. Flint told Sport24 on Thursday that the surface would nevertheless be a “fresh” one despite the volume of cricket already played this season. Reasonably typical characteristics can be expected, with bounce of the tennis-ball variety to keep the seamers interested - although the carry may be nothing too special - and prosperity also likely for batsmen who knuckle down diligently. The Kingsmead-schooled Flint has had some four years at Newlands now, enough experience not to be too unruffled by the fickleness of the Cape Town weather: a few days of above-average, often scorching heat were followed on Thursday by a sudden switch in the wind to the north and a few drops of rain at the ground. But “sunny and mild” is the anticipated, near-ideal medicine in the remainder of the lead-up to the Test and the lanky groundsman is pretty confident that the proverbial “good cricket wicket” is in store. It seems he is under no special pressure to prepare a surface lopsidedly catering for the needs of the Proteas’ eternally highly-touted pace attack; both Cricket South Africa and the Cape Cobras’ bosses will be quietly hoping for a Test that goes an acceptable distance despite the home team’s No 1 Test status and the Black Caps’ current insecurity and some fears they may be routed. Certainly there is a good case for arguing that Graeme Smith’s team ought to be capable of beating the New Zealanders at home, regardless of whether the pitches they play on are rank featherbeds, inadvertent green-tops or fall somewhere in between. More often than not, modern Newlands Test tracks earn healthy post-game accolades for their all-round fairness. The last Test there, which also featured relative minnows in Sri Lanka (fallible out of their own environment) and in the same “New Year” slot, saw South Africa all but win by an innings to secure the series 2-1 – they prevailed by 10 wickets after chasing a nominal target of two in the fourth knock. Unfathomably sent in by Tillakaratne Dilshan after the visitors had won the toss, the Proteas had gleefully amassed 580 for four declared, with a double century for Jacques Kallis (who so seldom fails to cash in at his most beloved venue) and “single” doses from AB de Villiers and Alviro Petersen. The Lankans could only post 239 in reply, although in their follow-on applied themselves much better and nearly got to the 350 mark, only confirming that the strip held few real demons. Of course memories are still very clear of the prior Test match at Newlands, a little earlier in the 2011/12 season, when South Africa also beat arch-rivals Australia by eight wickets in a wacky, rollercoaster ride. No fewer than 23 wickets tumbled on day two of the three-day encounter, with South Africa’s first innings of 96 being quickly followed by the Baggy Greens’ 47 all out in their own second turn at the crease. But Flint is by all accounts not having any sleepless nights over that match, and nor should he: it was simply what he diplomatically describes as “hopefully a freak occurrence”. After all, if there was any suspicion of serpents hissing just below the deck, such fears were laid totally to rest by South Africa restoring sanity to proceedings in knocking off the target of 236 with only two wickets falling, and both Smith and Hashim Amla registering tons. 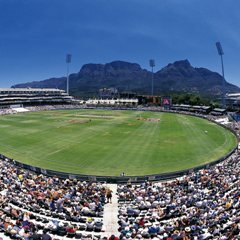 Although Newlands has hosted plenty of limited-overs contests this season at franchise level, there has been only one Sunfoil Series fixture, completed shortly before Christmas when the log-leading Cobras thrashed the Titans by 10 wickets. But the one-sided nature of the match was probably more because the visitors fielded a particularly raw, young side than because the Highvelders were spooked by the conditions, in which first Justin Kemp and then fellow-veteran Johann Louw earned five-wicket hauls.